U.K. Independence Party leader Nigel Farage says Britain should leave the European Union. Key themes in his campaign, including sharp criticism of the country's immigration policies, are similar to Donald Trump's positions in the U.S. presidential race. When American Erik Bidenkap arrived in London from the U.S. six weeks ago, he thought he was leaving behind the toxic politics of the U.S. presidential race. Bidenkap said he was hoping for a more intellectual, perhaps even philosophical, discussion of the question U.K. citizens will decide Thursday: whether to leave the European Union. "I expected there would be more civility, politeness, I guess," Bidenkap said over pints at a pub near his apartment in London's Notting Hill section. "I expected the conversation to be of a higher level." Instead, he found what he called the same kind of scare tactics, particularly focused on immigrants and Muslims. He said one group backing the United Kingdom's exit from the EU — or "Brexit" as it's known — tried to capitalize on the recent mass shooting at a nightclub in Orlando, Fla.
"Islamist extremism is a real threat to our way of life," read a message posted on Twitter by Leave.Eu. "Act now before we see an Orlando-style atrocity here before too long." In his brief time here, Bidenkap said he found that some similar issues — globalization and economics — are driving the Brexit and U.S. presidential campaigns. "In America, politicians are saying, 'We're losing to China, we're losing to Mexico, they're stealing our jobs,'" said Bidenkap, 33. "Here in Great Britain — same thing — you've got these open economic borders, this open economic zone with the rest of the continent and people are feeling like they're losing their jobs, they're not able to sell their goods at a fair price." The key politicians championing these arguments on either side of the Atlantic are Nigel Farage of the nationalist U.K. Independence Party and Donald Trump, the presumptive Republican nominee. Trump has talked about banning Muslims from entering the U.S. and about Mexican "rapists" crossing the border. 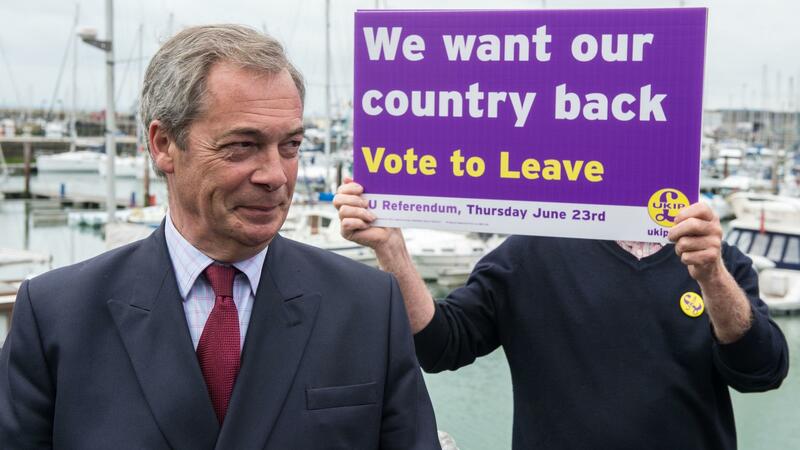 Last week, Farage unveiled a billboard of a photo of a line of hundreds of refugees. "Breaking Point," the billboard read. "I'd put them in the same box," said Elizabeth Evans, a county councilor with the Welsh Liberal Democrats, chatting on the street one afternoon in Aberystwyth, a small city on the Welsh coast. Evans says Farage, like Trump, is a charismatic populist who has tapped into public frustration. Farage "based his whole rhetoric, his whole story around immigration," she said. "And when I hear Donald Trump, I just hear comparisons in what they're saying." Analysts say some of the same economic factors that fueled the rise of Trump are also driving the Brexit debate. "Both in Britain and America there are millions of people who haven't seen their incomes move ahead," said Frank Luntz, an American pollster and communications consultant who has done work in Britain for decades. Luntz, who is in London for the referendum, said Trump and Brexiteers like Farage appeal to people who've never quite recovered from the global financial crisis and feel abandoned by establishment politicians. Americans "believe that the political system and economic system is rigged against them," said Luntz. "That same sentiment is happening in Britain with about 70 percent believing elites are hostile and actually making their lives more difficult — the very people who were elected to listen and learn and help people get through their day-to-day lives." Both the Trump and the Brexit campaigns are trying to reverse globalization, which is attractive to many of the millions of workers in both countries who've been left behind. Thomas Wright of the Brookings Institution, a Washington think tank, sees this as a worrisome moment. "It does appear we are at a tipping point in terms of the future of our politics," says Wright. "Does it continue to be a politics that is generally outwardly focused, focused on an open global economy and opportunity and optimism? Or is it one that is nationalistic and more inward looking and more about closing countries off?" Wright says the stakes for the future economic cooperation among countries are high. This week's vote in the United Kingdom and November's ballot in the U.S. may begin to tell us which way the Western world is headed. ROBERT SIEGEL, BYLINE: As we have heard all week, migration is a hot button issue here. It's one of the big issues that brought about this week's referendum. Voters who support leaving the EU say take control of immigration. In fact, they say the British have to take back control of their country. Well, those cries sound a lot like our presidential election this year. And as my London-based colleague Frank Langfitt reports, there are similar themes in the campaigns to get Britain out of the European Union and the one to put Donald Trump in the White House. BIDENKAP: Nice to meet you. LANGFITT: Very nice to meet you as well. Eric Bidenkap arrived in London from the States six weeks ago for a new job. We met recently at a pub in Notting Hill. And over pints, he said he thought he was leaving behind America's toxic campaign politics for a more refined debate here on Brexit. BIDENKAP: I expected that there would be more civility, better manners, I guess, you know, politeness. I wouldn't call it political correctness, but I expected the conversation to be of a higher level. LANGFITT: Instead, he found what he called the same kind of scare tactics particularly focused on immigrants and Muslims. BIDENKAP: I was really curious to see after the shooting in Orlando if that would be used as an example here to vote to leave, and it was. LANGFITT: What did you think of that? BIDENKAP: It felt like a cheap ploy preying on people's fears when people are feeling vulnerable. LANGFITT: And Erik Bidenkap says similar issues are driving the debates on both sides of the Atlantic. BIDENKAP: In America, politicians are saying we're losing to China, we're losing to Mexico. They're stealing our jobs. And here in Great Britain - same thing. You've got these open borders, this open economic zone with the rest of the continent. And people are feeling like they're losing their jobs, that they're not able to sell their goods at a fair price. LANGFITT: The key politicians championing these arguments are Nigel Farage of the nationalist U.K. Independence Party and Donald Trump, the presumptive Republican nominee. ELIZABETH EVANS: I'd put them in the same box, both of them. LANGFITT: Elizabeth Evans is a county councilor with the Welsh Liberal Democrats. She says Farage, like Trump, is a charismatic populist who's tapped into public frustration. EVANS: He's based his whole rhetoric, his whole story, around immigration. And when I hear Donald Trump, I just make comparisons in what they're saying, with his wall between Mexico and the United States. FRANK LUNTZ: Both Britain and in America, there are millions of people who have not seen their incomes move ahead. LUNTZ: The political system and the economic system is rigged against them. And that same sentiment is happening in Britain with about 70 percent believing that the elites are hostile and actually making their lives more difficult - the very people who were elected to listen and learn and help them get through their day-to-day lives. LANGFITT: Both the Trump and the Brexit campaigns are trying to reverse globalization. Thomas Wright of The Brookings Institution, a Washington think tank, sees this as a worrisome moment. THOMAS WRIGHT: It does appear we are at sort of a tipping point in terms of the future of our politics. Does it continue to be a politics that is generally sort of outwardly focused and focused on an open global economy and opportunity and optimism? Or is it one that's more nationalistic, more inward-looking and more about closing countries off? LANGFITT: Wright says the stakes for economic cooperation among countries are high. And this week's vote in the United Kingdom and November's ballot in the U.S. may begin to tell us which way the Western world is headed. Frank Langfitt, NPR News, London. Transcript provided by NPR, Copyright NPR.